Has pleading guilty left Rebecca better or worse off during the fourth and final season of the Crazy Ex-Girlfriend TV show on The CW? As we all know, the Nielsen ratings typically play a big role in determining whether a TV show like Crazy Ex-Girlfriend is cancelled or renewed for season five. (In this case, the show’s fate has already been decided.) Unfortunately, most of us do not live in Nielsen households. 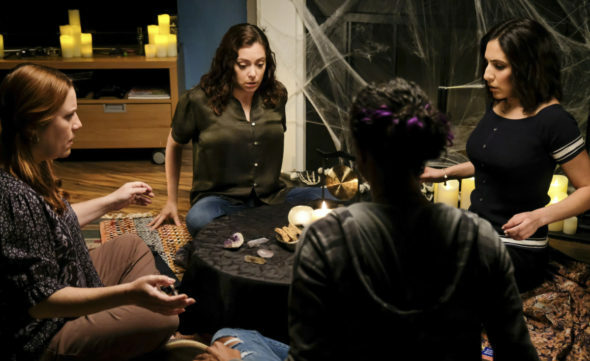 Because viewers feel frustration that their viewing habits and opinions weren’t considered before deciding to end the show, we’d like to offer you the chance to rate all the Crazy Ex-Girlfriend season four episodes. A CW satirical musical comedy, Crazy Ex-Girlfriend stars Rachel Bloom, who co-created the show with Aline Brosh McKenna. As Rebecca Bunch, she’s a “tightly wound” Ivy educated lawyer. The cast also includes Vincent Rodriguez III, Donna Lynne Champlin, Pete Gardner, Vella Lovell, Gabrielle Ruiz, and Scott Michael Foster. After reconnecting with Josh (Rodriguez), her summer camp crush, Rebecca quits a top New York law firm and takes off for California. She’s not following Josh though, as that would be crazy. Season four kicks off with Rebecca having pleaded guilty to a federal offense, because she feels compelled to pay for every wrong thing she has ever done. What do you think? Which season four episodes of the Crazy Ex-Girlfriend TV series do you rate as wonderful, terrible, or somewhere between? Did The CW make the right choice to end Crazy Ex-Girlfriend with its fourth season? Don’t forget to vote, and share your thoughts, below. More about: Crazy Ex-Girlfriend, Crazy Ex-Girlfriend: canceled or renewed? Season 4 of Crazy Ex Girlfriend is just awful. I find it difficult to care about any of these characters. Nathaniel, the self-absorbed narcissist is the most sympathetic character. Its hard to follow because the story is all over the place. The first three seasons were very good. Even the actors seem to know how bad the writing is this year. The only highlight so far is Jim’s song, “Don’t Be a Lawyer”. Ill be surprised if it makes it through the season.